Recently I dyed the tips of my hair magenta. I resisted for a long time, holding fast to the belief that 30-something mothers shouldn’t indulge in such outlandish trends. I thought brightly colored hair was the equivalent of wearing a mini-skirt past your prime or baring your midriff after the child-bearing years. But I kept thinking about it, and seeing the pictures in magazines. Finally I decided if I just did the tips, I could cut it off if I got embarrassed. I mean, I’m not a rock star. But I’m not a politician, either. Who says I can’t make a major fashion statement with my hair? It helped that the hair stylist I’ve been seeing lately always has some sort of bright streak in her own hair. It fits her personality -- she has colorful tattoos and an edgy cut, and I knew that she would be thrilled by my hair adventure. She explained that since my hair was already highlighted blonde, it was easy to add the bright colors. (If your hair is dark, it’s a two-step process to bleach out your strands before dyeing them rainbow.) I chose the deep pink because it complements my skin tone and most of my wardrobe, but she also showed me pretty purple and indigo options. The stylist dyed only the tips, but wove the color in, choosing select locks of hair and making each section a slightly different length. 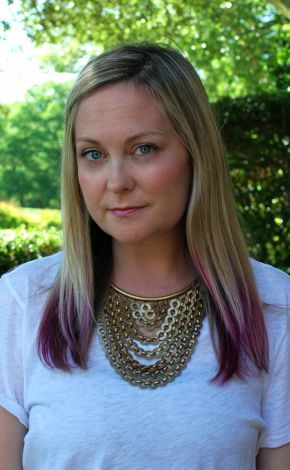 This created a more subtle and professionally done look, if magenta tips can look subtle and professional. She told me to avoid directly shampooing the colored ends to keep them from fading, and to be careful with white bath towels or white sheets, although neither of things ended up being a problem. Who says I can’t make a major fashion statement with my hair? I’ve had the pink tips applied twice more since I took the original plunge early this year, making it a part of my regular hair appointment. I’ve gotten a few stares and lots of comments, but it hasn’t been the terrible response I feared. This is probably because I live in Los Angeles, where wild is normal, but it’s also because the rainbow hair trend is growing. I notice it everywhere now, and not just on teenagers. I doubt it will become a standard look, but it seems more accepted than I would have guessed. As for my own choice, I like the unexpected pop of color it gives any outfit, and I like that I can pull my hair back for dressier occasions and the ends go unnoticed. I’m not sure how long I’ll keep it, but for now it feels like a signature style, something that sets me apart and that I like about my appearance. I thought I was too old to experiment with certain trends -- but now I’ve decided that I’m too young not to.